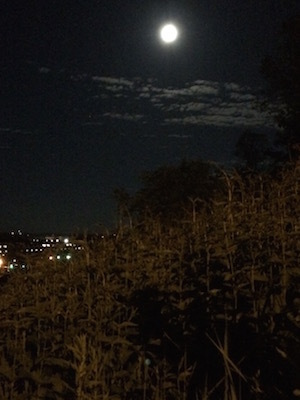 Last night my partner Scott invited me on a full moon walk. We walked on the night path that he usually takes with our dog and went places I would never go alone in the darkness. We walked through a dusty parking lot where a few cars were still parked. We walked along a rugged road that led up to a water tower. We walked past shapes that rose out of the darkness and warnings to “watch your step”. We walked close to a once giant tree’s trunk and a field of grass that seemed to be awaiting the fireflies of July. And we ended up gazing at the moon on a boulder big enough for the 3 of us. I came home feeling blessed by the moon. Go outside tonight and spend some time with that giant orb that lights our night sky and pulls the ocean tides. It only takes a few moments to stand in the light of the full moon, breathing gently in and out, to receive its’ blessing. This entry was posted in nature, practices. Bookmark the permalink. Both comments and trackbacks are currently closed.